Plot Summary: Mirai and Rico come to the human world to play, but are separated when the witch Sorciere and her servant Torauuma suddenly appear. 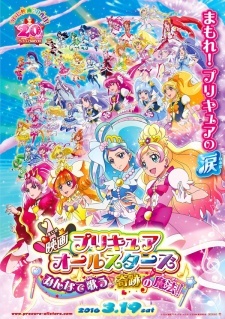 Their aim is to acquire the tears of the 44 Precure girls, using them for her "Most Evil Magic." Only the friendship of all 44 Precure girls will allow them to protect the world.